Maia, Chae Rin, Lake, and Belle continue their face-off against Saul in Book 2 of the Effigies series, following Fate of Flames (2016). After a failed attempt to capture Saul, the public is losing confidence in the Effigies, and the sect is scrambling to restore the illusion of order. 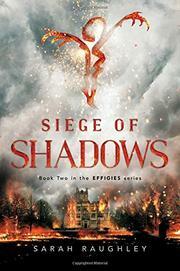 Meanwhile, Maia, Chae Rin, Lake, and Belle have more urgent matters on their minds as Saul remains ever elusive, and they can add engineered Effigies to their growing list of enemies. As if that weren’t enough, it turns out the sect definitely can’t be trusted. It’s just another day in the life as Maia also plays tug of war with Natalya, the previous fire Effigy, for control of her body. Oh, and Rhys, her crush, may have murdered Natalya—a revelation that brings far-reaching consequences. As the questions about their origins pile up and what that means in this new fight against Saul, more than ever, the girls need to work as a team. This has all the makings of a great sequel, but it stumbles in its execution. Meandering plotlines, Maia’s prolonged internal battles, and clumsy character development make for a slow-paced, plodding read. Maia’s mother was Caribbean, Lake is British-Nigerian, Chae Rin is Korean, and Belle is a white European, but these diverse cultural characterizations don’t manifest themselves in any meaningful way.